In our MummyNatal birth preparation classes, and Natal Birth Workshops for mums & birth partners, we don’t teach ANY second stage techniques. Why? Over a number of years, I worked with a number of parents who felt conflicted about their birth experiences. They were really pleased with their birth experience, but were worried they had ‘failed’ right at the end, because when they were birthing their babies, they said ‘my body just pushed, I couldn’t stop it!’. Through their antenatal preparation, they had come to understand that ‘pushing was bad’ and instead they ‘should’ have used whatever the specific technique was they had been taught. Some felt almost ashamed for not being able to resist the urge to push which they had experienced, and were questioning whether it could be described as a good birth experience, even thought it had felt so to them, just because of this. As we talked, it became apparent that what lots of them were describing experiencing, was something often referred to as the Fetal Ejection Reflex (or Spontaneous Birth Reflex). This is when during birth, a woman feels safe and protected, has privacy and is undisturbed, and the body instinctively works to birth the baby. Many women who have experienced the Fetal Ejection Reflex will talk about how powerful the sensations are. How the body takes over. The instinctive pushing. It is not a conscious action, it is a reflex, an urge which cannot be stopped or controlled. Due to the medicalised environments and approaches to birth in modern society, this is not something which everyone gets to experience, so when it does happen, it is a real celebration of the environment a woman has been supported to birth within, and the mental and physical in-tuneness she was able to reach. Personally, I have pushed five babies out. Two of those, my first, were both midwife-coached pushing. My next three babies, born at home, I definitely pushed them out too, but it was entirely different. This was physiological pushing. There was no coaching. My body was leading. I didn’t need to think, to consciously remember to do anything. It was an urge, something which just happened. As the Fetal Ejection Reflex took effect, it was incredible how powerful it was, and how efficient. It felt so much more effective, and was definitely so much faster, than the coached pushing efforts in my first two births. So it’s not as simple as all pushing is the same, or all pushing is ‘bad’. Pushing is just a descriptive term, but can be experienced in different ways. If it feels right to the person doing it, in that moment, that is what matters. And there are undoubtedly times when coached pushing has its place too. So at MummyNatal, this is why we don’t teach specific techniques to use at this point of birth. We believe that every every circumstance is unique, and we need to allow for each individual birth to flow. If we are able to create an environment which is conducive, our thinking brain doesn’t need to worry about remembering or using techniques – we just tune into what feels right for us, in each moment, and let the body work. Michel Odent, who has spoken about this reflex at length, described it as “can happen only when the attendants are conscious that the process of parturition (childbirth) is an involuntary process and that one cannot help an involuntary process. The point is not to disturb it.” When it comes to birth, we cannot control it, but by giving women and their partners support to prepare for birth, confidence in birth, understanding of how to create a birthing environment which feels safe for them, and to learn how to tune into the signals of the birthing body; we prepare them for birthing in an individualised and very different way to teaching prescriptive techniques. Ultimately, if something feels right to you while you are birthing, that is what matters. 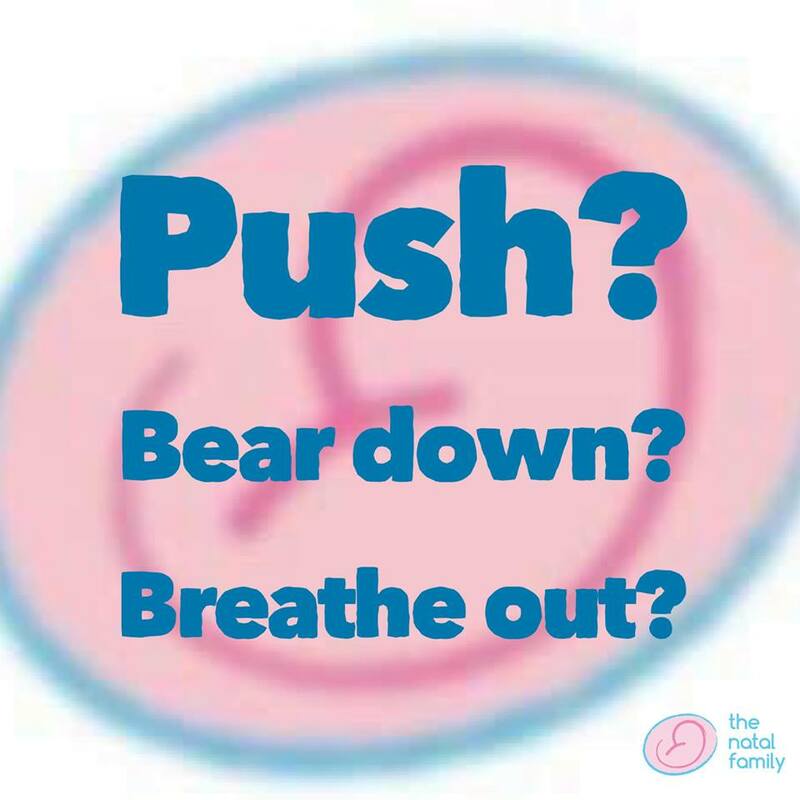 Push, breathe deeply, breath lightly, bear down, move around, stay still, ask for guidance, touch your baby as they are being born, don’t touch your baby as they are being born, sing, scream, cry, hum, laugh, sing, sway… there is no such thing as the perfect birth experience, apart from the one which feels good for YOU. Steph Beaumont is co-founder of The Natal Family, and co-author of The His and Hers Guide to Pregnancy and Birth.